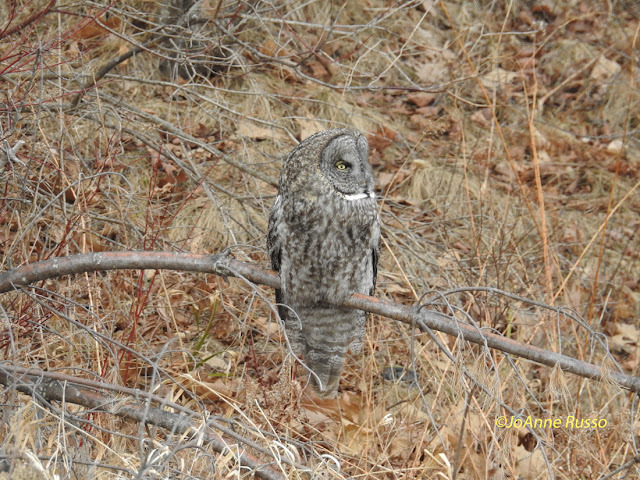 Great Gray Owl - Oak Street fields, Newport, Sullivan Co., NH. March 3rd, 2017. Images appear courtesy of JoAnne Russo. 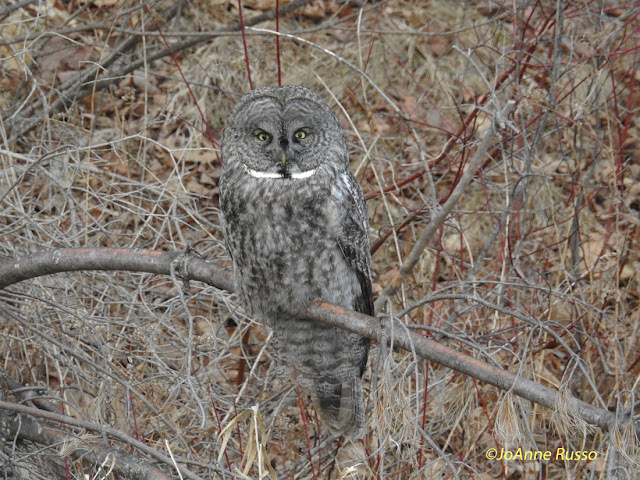 A mere fifty miles north of the Massachusetts state line, this handsome Great Gray Owl put on a fabulous show as it roosted in the open at the edge of a wet meadow in Newport, New Hampshire. A major camera blunder left me without images for the day, but luckily Laura Gaudette and JoAnne Russo also got to the site on the same day, and JoAnne very kindly offered some of her excellent images to share on this post - thanks JoAnne! The New Hampshire bird was apparently first found on or around Feb 25th, but it wasn't until about March 2nd that I finally picked up the thread. As it happens, the bird was not seen for most of the 2nd but did put in a late afternoon appearance that day raising my optimism for a chance visit on March 3rd. Thanks to a timley email from Dylan Jackson (many thanks Dylan) I was able to make the journey north in between Matan's school hours taking Route 10 all the way from Northfield to the site in Newport. The drive was just 58 road miles from our home in Northfield and turned out to be especially scenic north of Keene, NH. As I drove the route, I couldn't help but wonder how many Greay Gray Owls might actually be out there in this incursion year and maybe, just maybe, how about the prospect of one in Massachusetts?! 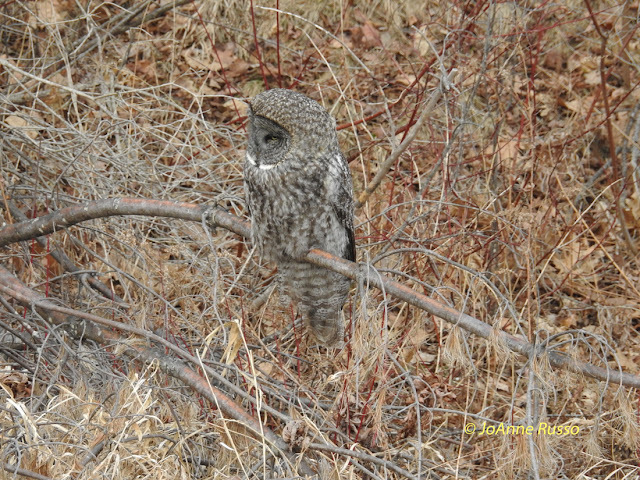 Remarkably, and before I'd finished composing this post, Brian Rusnica unearthed an ebird entry that clearly shows an unambiguous Great Gray Owl photographed just north of Northampton, Hampshire County, Massachusetts on February 22nd. The photographer, evidently not expecting anything out of the ordinary, had labeled his bird a Barred Owl and as such it was never flagged as 'rare' by ebird allowing the sighting to go unnoticed for 11 days. Naturally folks will be out searching and it remains to be seen whether or not the bird can be refound - I have a feeling it might be. 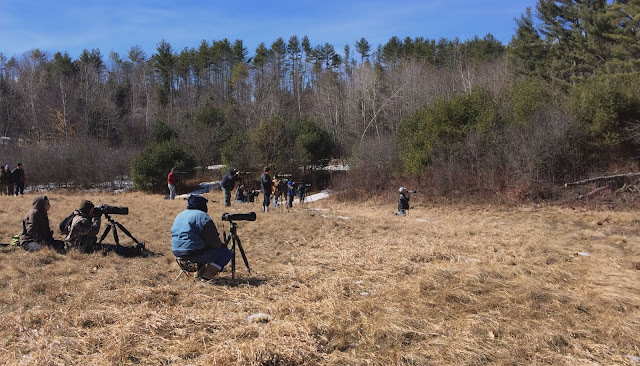 In any event, kudos to Brian Rusnica for trawling ebird and spotting the photos and 'chapeau' to Derek Pritchard for taking the images and placing them in a public forum - excellent stuff! Great Gray Owl Scene- Oak Street fields, Newport, Sullivan Co., NH. March 3rd, 2017.
who just has to get closer than everyone else. Thankfully the owl wasn't flushed on this occasion. 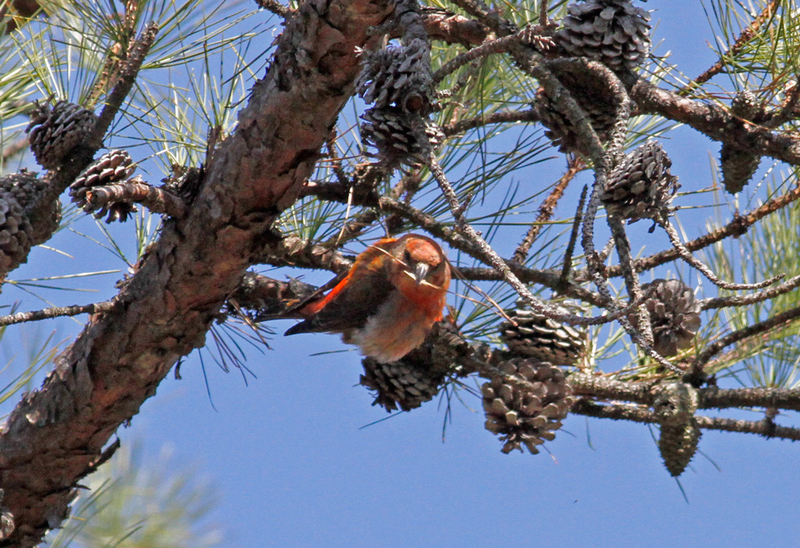 Red Crossbill - first-year male, Franklin Co., February 28th, 2017. The end of February has been incredibly mild and exceedingly spring-like. Suffering from a little cabin fever, I felt the need for a full day in the field but rather than drive two hours to the coast I chose to stay local. With no fixed agenda or premeditated plan, I attempted a rather low key 'big day' in Franklin County, something that I've never tried before but I am likely to repeat. The goal was to simply poke around and see what I could dig up within a few miles of the house. The day was split into two sessions (06:30-12:30 and 15:00 - 19:30hrs) and I ended up with a tally of 54 species which I thought was pretty decent considering that it was a solo effort. As so often with big days, the 'big misses' hurt and Cooper's Hawk, Wild Turkey, American Woodcock, Horned Lark and Golden-crowned Kinglet somehow managed to elude me, and all of which are present currently in the local area. 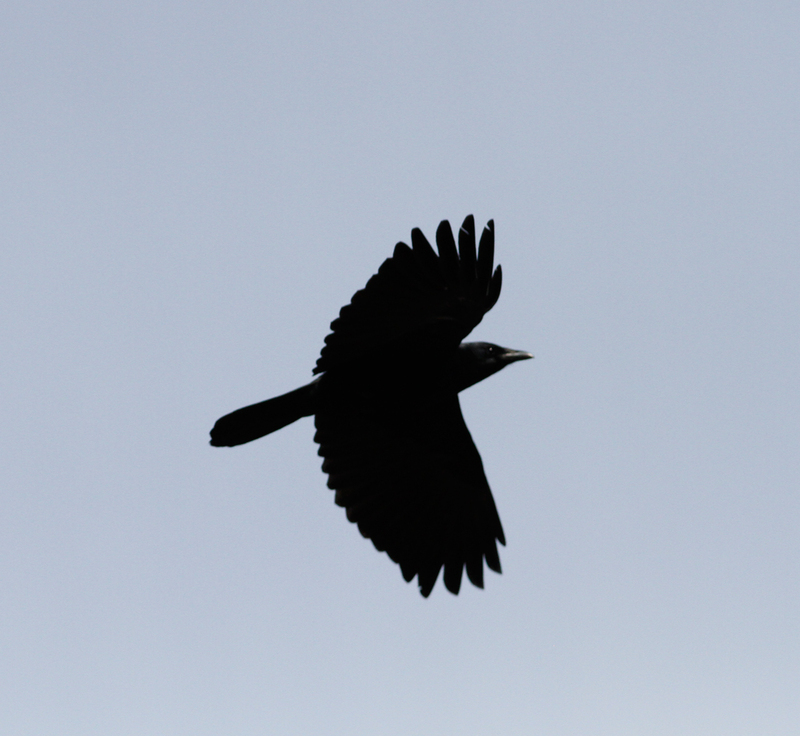 Then there's the 'near misses' with species such as Black Vulture and Barrow's Goldeneye seen before the 28th, or the Northern Harrier and Merlin in Gill the day after! Anyhow, it was a great test and a nice reminder of just how diverse the Pioneer Valley can be at times. Red Crossbill - adult male, Franklin Co., February 28th, 2017. 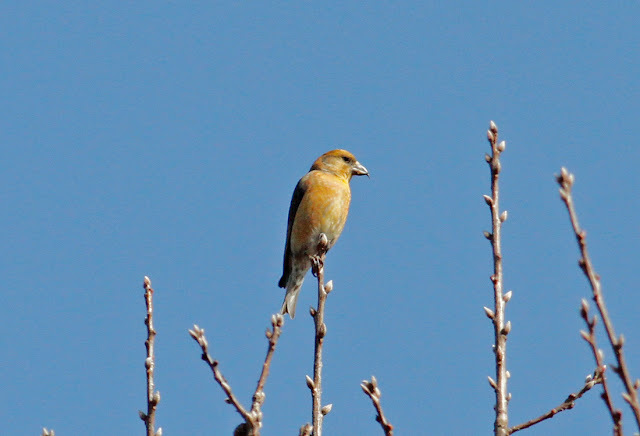 Red Crossbill - adult male, Franklin Co., February 28th, 2017. Apparently collecting nest material. Red Crossbill - adult male and female, Franklin Co., February 28th, 2017. Courtship feeding? Red Crossbill - adult female, Franklin Co., February 28th, 2017. 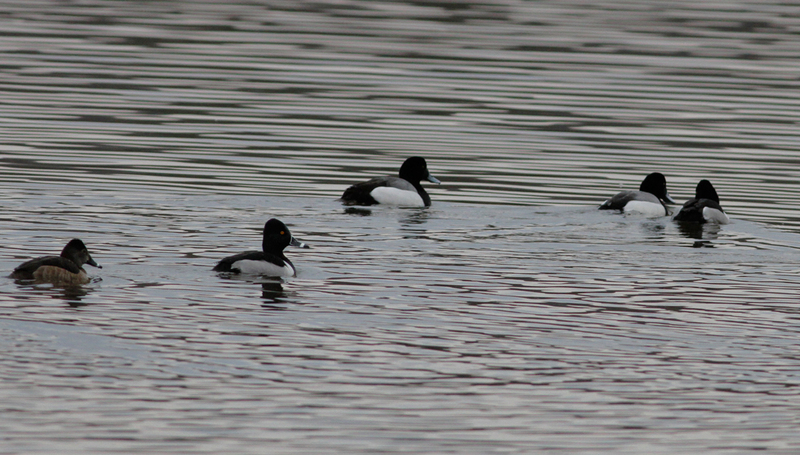 Ring-necked Duck - 42 (one raft of 31 at Barton Cove). Greater Scaup - 2 males at Turner's Falls. Nice but down from the five males on the 26th. Northern Saw-whet - 3 (all males 'soft' tooting). 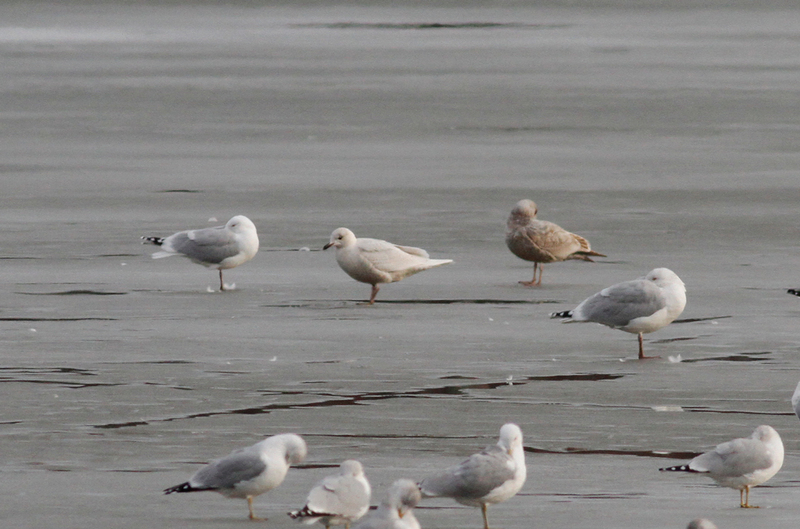 Kumlien's Iceland Gull - 4 (3 first-cycle, 1 second-cycle), Barton Cove, Gill. 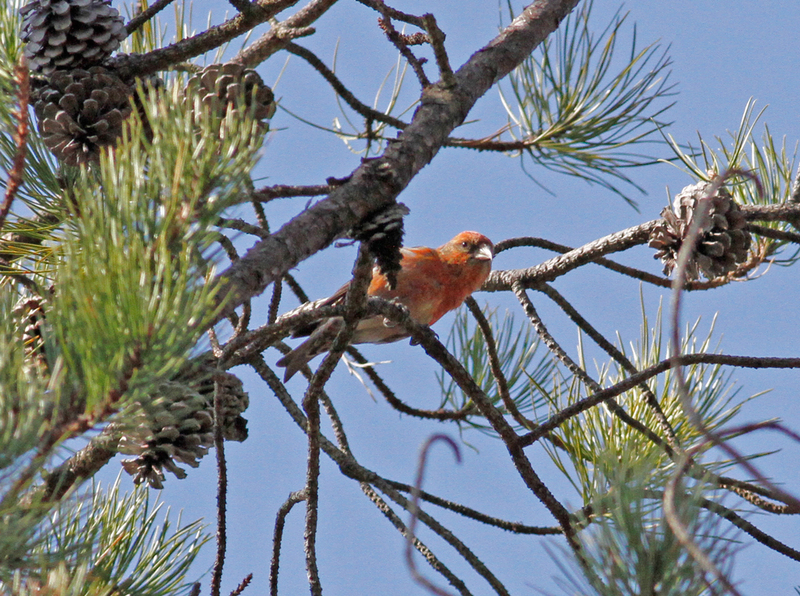 Red Crossbill - 12 plus. 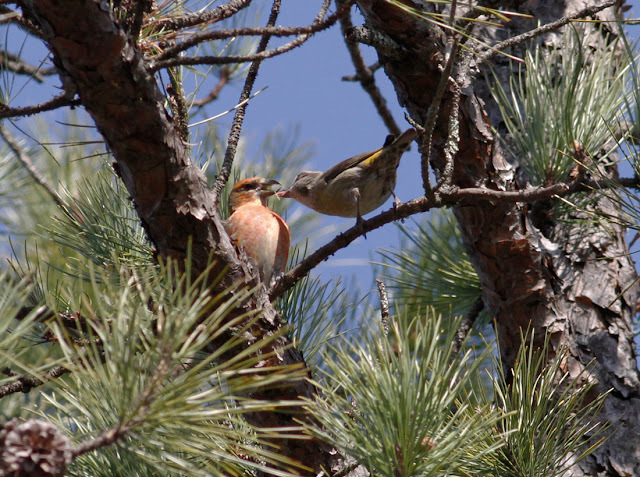 Males singing, several pairs seen carrying nest material and courtship feeding observed. However, no actual nests located. Fish Crow - 1 calling Unity Park, Turner's Falls. Back at one of last year's breeding sites. Weather: 32 deg F at first light rising to around 62 deg F by late afternoon. Clouds and light showers early giving way to a clear, sunny afternoon with a light but sometimes blustery south-westerly breeze. Miles: 58 driven; 4 walked. Fish Crow - Unity Park, Turner's Falls, Franklin Co., February 28th, 2017. Eight pairs bred in Turner's Falls in 2016 including three pairs in Unity Park alone. Greater Scaups - two males with Ring-necked Ducks, Turner's Falls, Franklin Co., February 28th, 2017. 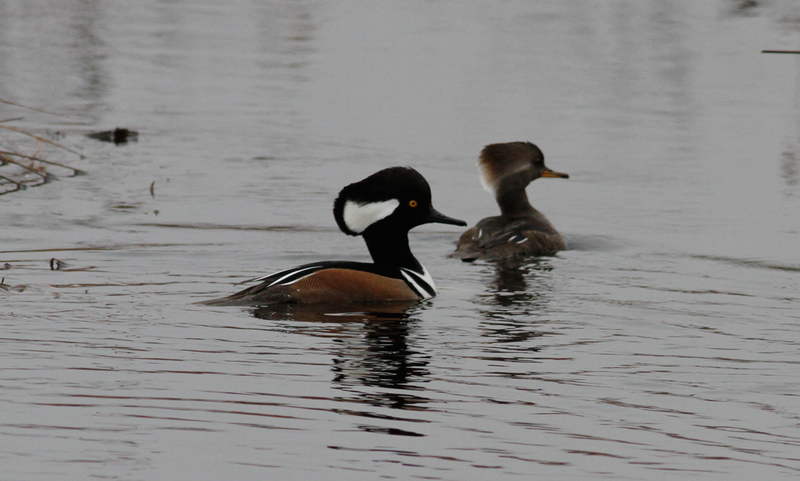 Hooded Mergansers - adult male and female, Franklin Co., February 28th, 2017. 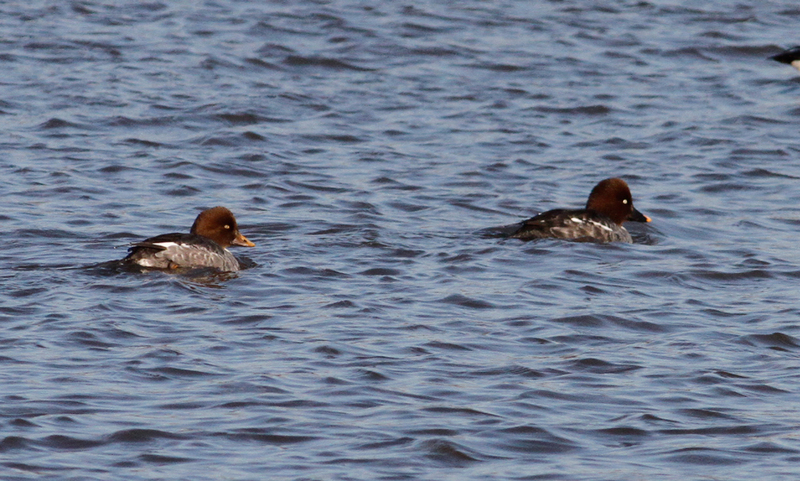 Breeding pairs moving back into the small ponds and swamps, this pair was in Gill. 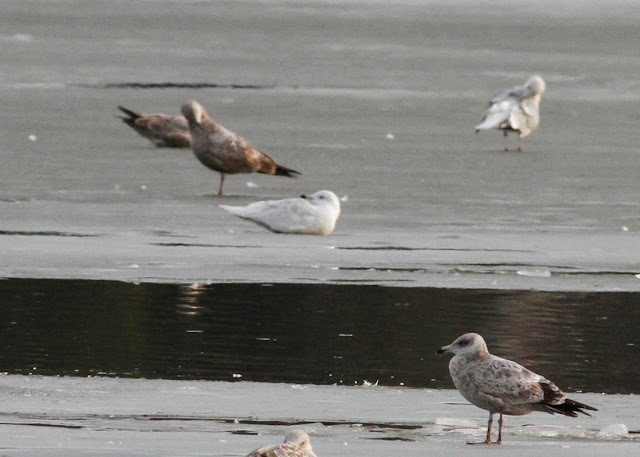 Kumlien's Iceland Gull - first-cycle, Barton Cove, Gill, Franklin Co., MA. February 28th, 2017. Kumlien's Iceland Gull - second-cycle, Barton Cove, Gill, Franklin Co., MA. February 28th, 2017. 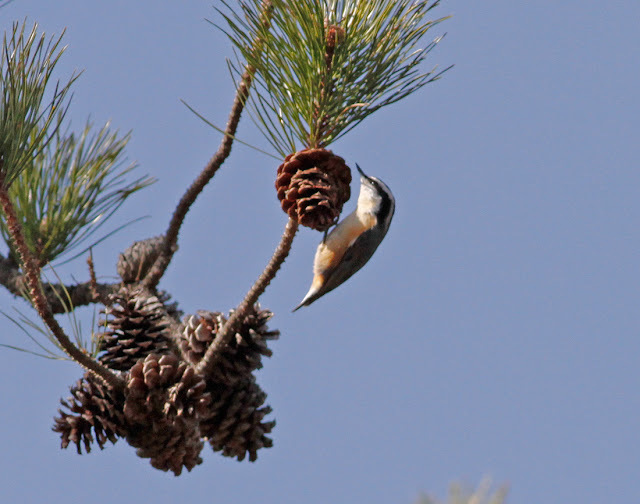 Red-breasted Nuthatch - Franklin Co., February 28th, 2017. 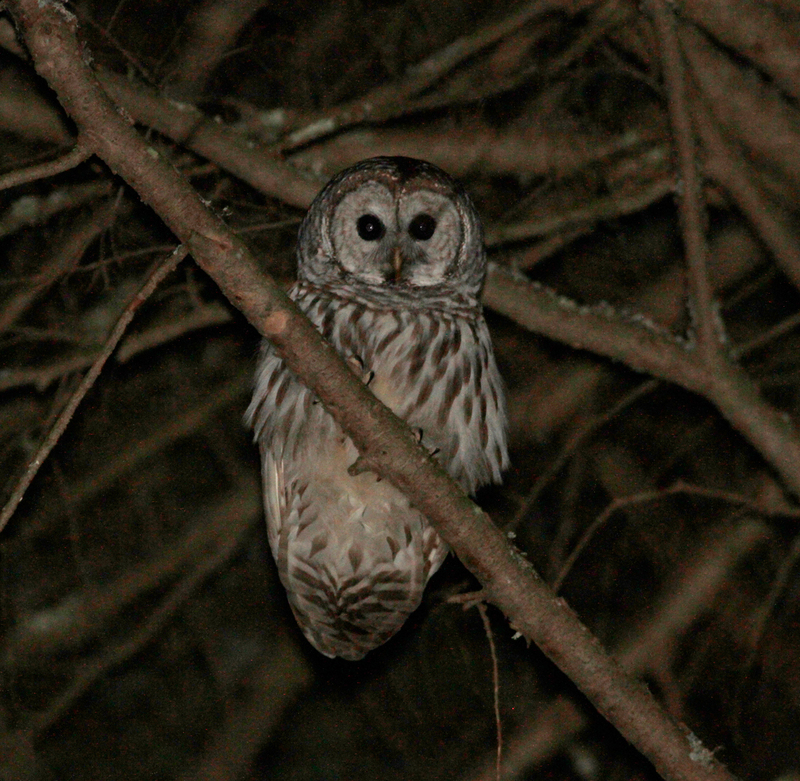 Barred Owl - Franklin Co., February 28th, 2017. 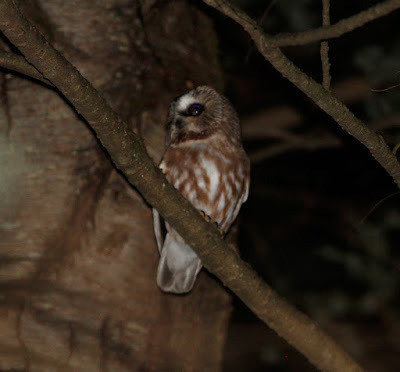 Northern Saw-whet Owl - Franklin Co., February 28th, 2017. A busy evening for these with three males calling from just one location. Barrow's Goldeneye - female, Turner's Falls, Franklin Co., MA. February 27th, 2017. 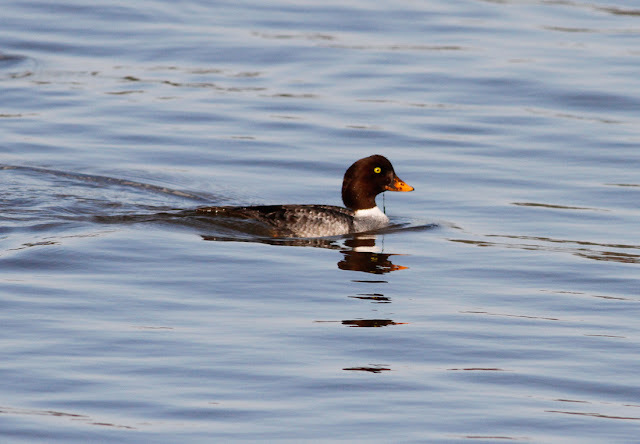 Every once in a while a post to the Western Mass Birders Facebook page captures my interest, so when Mark Taylor posted news of a female Barrow's Goldeneye at the Turner's Falls power canal I was especially keen to take a look. Recent winters have been very good for Barrow's Goldeneye at Turner's Falls but this winter has been inexplicably poor. In fact, despite checking the goldeneye roost on many evenings in Dec through Feb, I couldn't come up with a single Barrow's, male or female. The only certain local report that I knew of was from Eric Huston on January 22nd when he had a male at Bennett Meadow in Northfield. 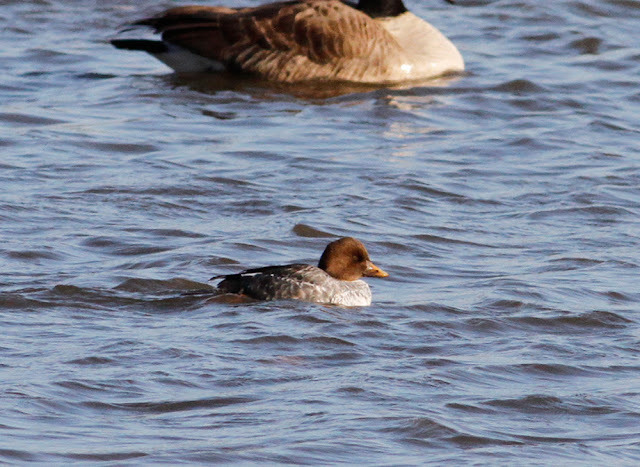 The situation had also been clouded by the presence of a couple of female Common Goldeneyes showing atypical bill coloration. Common Goldeneye - female with abberrant dull orange bill, Turner's Falls, Franklin Co., MA. February 27th, 2017. Common Goldeneyes - female with abberrant bill (left), Turner's Falls, Franklin Co., MA. February 27th, 2017. Potentially a pitfall for female Barrow's - can a hybrid could be excluded? I'm not sure. Mark's post to WMB seemingly generated very little interest but had certainly intrigued me. 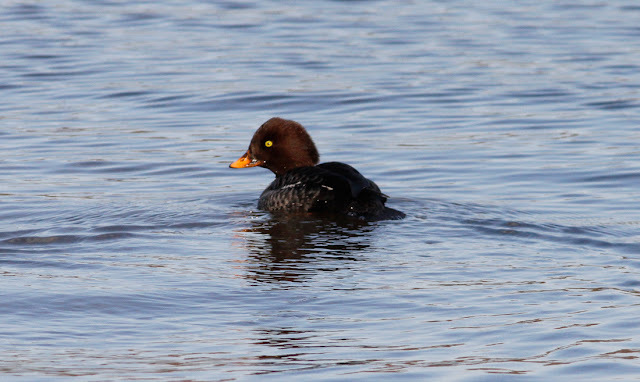 When I arrived at the power canal the first female goldeneye that surfaced was a Common with a dull yellow-orange bill! 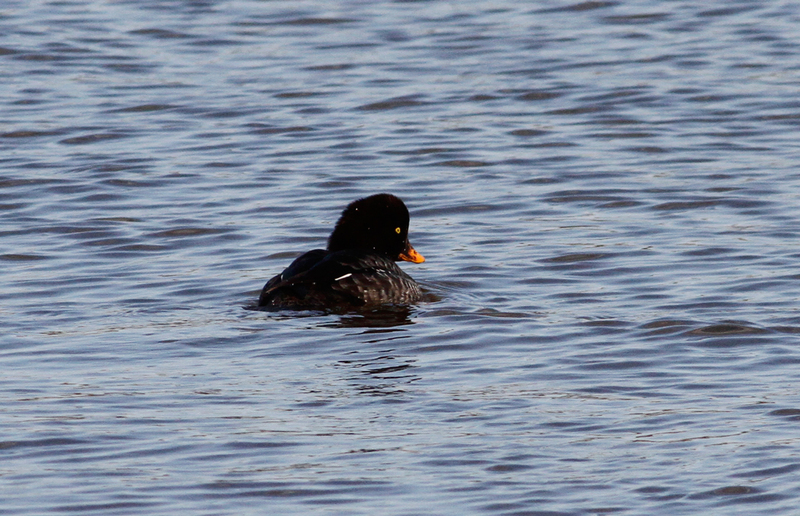 But with over a dozen goldeneyes diving in front of me, I patiently went through them all. I knew Mark to be a careful local observer and thought it unlikely that he'd get turned around by a Common Goldeneye with an abberant bill. A few moments later, a goldeneye surfaced right next to the guard rail about 10 meters from where I was standing - it was a beautiful female Barrow's and the closest goldeneye to me. For a good fifteen minutes I was treated to point blank views in exactly the spot that Mark had described. In fact it was so close to the guard rail that I would surely have missed it had I stayed in the car. 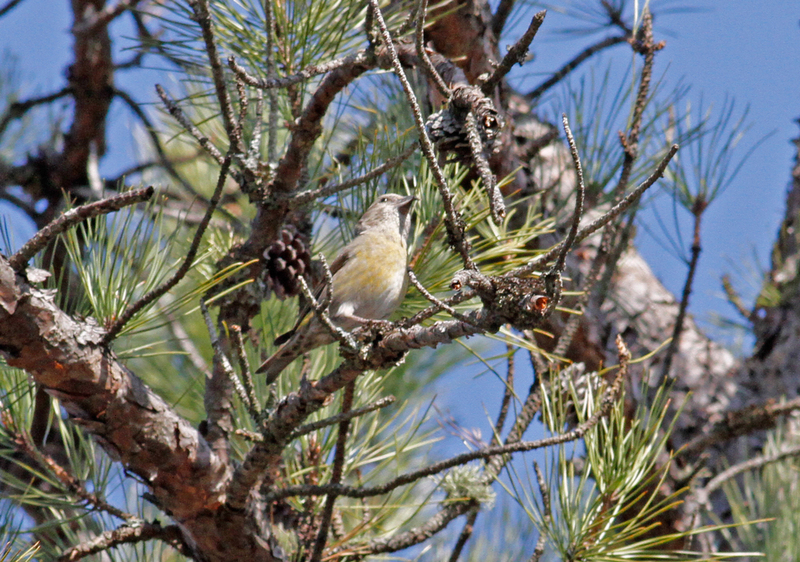 A beautiful bird and the only Barrow's that I've seen at Turner's Falls the entire winter. Thanks to Mark Taylor for his post.